Amazon’s making a big break for the tablet market and before its latest endeavours – which include the budget $50 tablet available in a six-pack and the HDX flagships from last year – the company’s forked Android approach certainly seemed to be working. 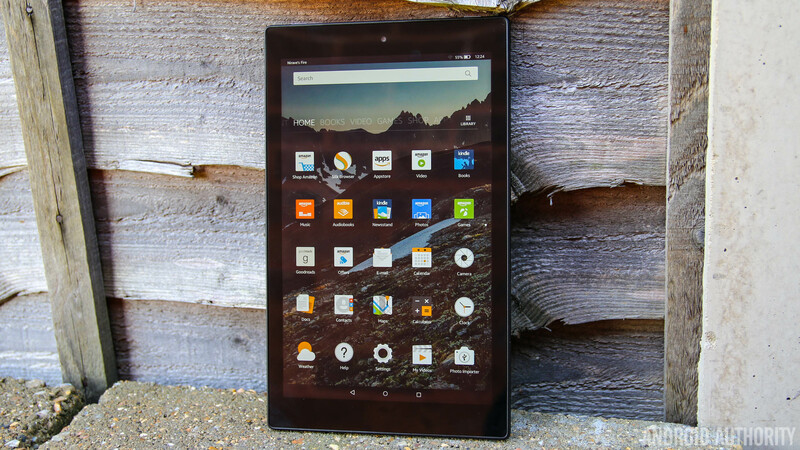 The company isn’t content with stopping there, as it has announced a few entries into its mid-range tablet portfolio and we went hands on with its largest ever tablet – the Fire HD 10 – to see how good Amazon’s latest efforts are. At a cost of $229, something has to give (compared to more expensive tablets) and in the case of the Fire HD 10, it is the feel of the tablet. Essentially, Amazon’s slate is nothing more than a metal frame with a plastic overcoat, and it definitely shows, with the rear proving to be a fingerprint and smudge magnet. As a result, you’re most likely going to be forking out for a case if you want the tablet to look, well, premium. The Fire HD 10 is one of Amazon’s thinnest slates at just 7.7mm thick but the large body and 432 grams’ weight means you won’t be using this in one hand often. Yes, the tablet is thin and it’s relatively light, but the chamfered edges and plastic rear mean it’s relatively difficult to keep a grip on the tablet for a long period of time. As you might expect from a tablet with a low price tag, not everything is as premium as Amazon might claim and an area this is immediately noticeable is the display. The screen resolution of 1280 x 800 is a far cry from other tablets on the market and while it is quite bright – Amazon say it offers 400 nits brightness – the lack of Full HD is likely to be a let down for most people. Inside the surprisingly slim body, there’s a quad-core MediaTek processor – made up of two 1.5GHz cores and two 1.2GHz cores – along with 1GB RAM and 16GB or 32GB internal storage. A mammoth multitasking powerhouse this is certainly not, but thankfully, you can expand the storage using a microSD card, which is some consolation. On one side of the Fire HD 10, Amazon has included dual Dolby Atmos speakers, which – while having very little bass – are actually quite loud. On the back, there’s a 5-megapixel camera while the front has a 720p camera and while you could take photos using the Fire HD 10, they probably won’t be images you want to share. While Amazon’s hardware is certainly acceptable given the price tag, the Fire HD 10 does have a key issue – the 16:10 aspect ratio. Amazon says it stuck with this ratio as it found Fire users watch a lot of movies and this aspect ratio ensures there won’t be black bars when viewing a media file. The problem with this is the Fire HD 10 feels quite long and tall and can be quite unruly to hold in one hand, especially when reading a book. It’s a small irritation, but one that you should definitely keep in mind. Overall, the hardware isn’t the best on the market but it certainly gets the job done, and, as Jeff Bezos will have wanted, the Fire HD 10 is really a portal in the world of everything Amazon. How does the company do this? Through it’s forked-Android Fire OS approach of course. The Fire HD 10 runs on Amazon’s latest Fire OS 5 Bellini and the new OS brings an enhanced UI, updates to the platform and of course, even closer integration of Amazon’s various products and services. The updated interface in Bellini is designed to make discovering new apps and content as easy as possible for users and the home screen comes with dedicated pages to help you discover books, games and apps, video, music and audiobooks. The home screen is certainly interesting and user friendly and it’s a refreshing change from other Android tablets, which look no different to their smartphone counterparts. Bellini also brings a range of features (dubbed Activity Centre) allowing parents to control and/or limit what children can access, including games, videos and books. Amazon takes it one step further as it also lets parents view exactly what their child have been searching for, reading, watching or playing, as well as see exactly how much time has been spent on a particular activity. There’s no doubt that the Fire HD 10 is designed to be a one-stop-shop into the world of all-things Amazon and Bellini definitely delivers this, bringing support for Prime benefits in the Family Library, among other things. As far as a comparison against other Android smartphones go, it’s definitely different to the mainstream Android tablets you’re probably more accustomed to. Should you buy the Amazon Fire HD 10? This is a difficult one, as there are two parts to the answer: first, if use all of Amazons services frequently, then most definitely, this is a tablet that will simply enhance how you interact with the world’s largest retailer. That being said, if you don’t use Amazon services that often, you’re probably better than off buying an Android tablet running the full Google Play suite. Amazon’s forked approach means you get access to the Amazon AppStore and while you can side-load the Google Play Store, the reliance of Amazon’s services over Google’s means things you do on your Android smartphone or tablet, may not be possible on the Amazon Fire HD 10. As far as tablets go, the Fire HD 10 is one of the nicest tablets made by Amazon, but unless you’re part of the Jeff Bezos clan, it’s quite likely that you’ll find a tablet running full Android (and not Amazon’s forked approach) will be better for your needs.